Looking to grab the attention of fashion-savvy women, Boost Mobile's Debut i856w cell phone adds stylish ivory coloring and flattering design touches to the original i856, which was its first slider model. Combining the slender, light-weight features of the SLVR with the trend for loud colors in mobile devices for women, the Motorola Red SLVR cell phone for women is designed to maximize entertainment and customization options. 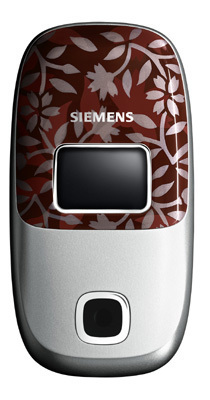 The Siemens CL75 is one of a handfull of cell phones for women combining elegance and technology. One version of the Siemens clamshell mobile phone sports a colorful floral motif on the case. On the inside, a large color display doubles as a pocket mirror - makeup not included. The Nokia Fashion Collections include the L'Amour Collection and the Distinctly Bold Collection, two sets of high-fashion Nokia cell phones for women. Perhaps the most feature-rich of the available cell phones for women, Samsung's SGH-E530 combines image, style and function in a fashionable handset first launched in the Middle East. The color pink has gone mobile, with pink cell phones becoming one of the popular hot trends in wireless devices. Martians beware - the phones from Venus have arrived, and they are in all shades of pink. Samsung BlackJack II pink smartphone. LG Shine slider phone in red. BlackBerry Curve in pink or red. Red Samsung Juke slider music phone. Stylish pink BlackBerry Pearl compact. LG Chocolate VX8550 music phone. RAZR V3m - classic RAZR thin red phone. LG Muziq LX570 music phone. Sidekick iD horizontal slider phone. HTC Touch - touchscreen phone. The Motorola Debut i856w provides one-touch instant access to a built-in camera with video capture and playback directly on the face of the phone, in addition to multi-media features including a music player and threaded text messaging. "We expect Motorola Debut i856w to appeal to female consumers who desire contemporary style and superior value from their wireless phone," said Neil Lindsay, chief marketing officer at Boost Mobile, the Sprint division that offers wireless phones and services with no contracts or activation fees. Combining the slender, light-weight features of the SLVR with the trend for "loud" colors in mobile devices for women, the Motorola Red SLVR cell phone for women is designed to maximize entertainment and customization options. The red cell phone delivers iTunes functionality, offering the ability to carry up to 7 hours of music or 100 songs. Like its predecessor, the Motorola SLVR in Black, the Motorola Red SLVR is less than half an inch thick and weighs 3.5 ounces. To complement the Motorola SLVR L7 Pink Phone in color and functionality, Motorola designed the H500 Pink Bluetooth Headset. When paired with a Bluetooth-enabled mobile phone, like the Motorola SLVR, the Motorola H500 Pink helps ensure hassle-proof, hands-free communication. Weighing less than 17 grams, the H500 Pink Bluetooth Headset is one of the lightest headsets in the industry. It features up to eight hours of talk time or 200 hours of standby time, allowing users to connect up to 30 feet away from their mobile phone. Weighing in at 90 grams, this chic Siemens phone comes with a built-in digital camera for photos or video. The camera feature is common to cell phones for women. There's good reason. According to M:Metrics, 25 percent of women have a camera-capable cell phone in the U.S., while only 21 percent of men do. And 60 percent of women use their camera feature frequently or occasionally with only 40 percent of men using as often. The CL75 tri-band phone has push-and-talk as well as walkie-talkie features, and its multimedia messaging capabilities provide a full range of options for chatting via text. "Women want a little text in their romance," according to revelations of a mobile marketing campaign conducted by ipsh! for The Oxygen Network's premiere of Mr. Romance. Post-campaign analysis indicated that women are more open and willing to receive mobile promotions via text messaging than other demographic groups. Pocket computer functionality meets elegance as the Nokia 7610 combines a slim and stylish design with a wide range of smartphone features. With the ability to capture, as well as print, edit, store and send images and videos, the Nokia 7610 is a comprehensive camera phone and imaging powerhouse. The Movie Director application lets you turn video clips into personal movies by adding special effects such as music, text, new colors or moving objects. The Nokia 7280, dubbed the "going out phone," offers a completely unique mobile design in cell phones for women. A keyless dial replaces the traditional keypad. Its high-gloss finish is complemented by leather and mirror accents. The Nokia 7270 fold-design phone is encased in etched stainless steel. This cell phone for women includes a clever application for converting clothes or shoe sizes, an FM radio, and a fashion headset. The Nokia 6170 is a stylish tri-band mobile phone model, complete with folding stainless steel finish and advanced features. It synchronizes contacts, calendars and to-do-lists, and allows fast data transmission for emails and streaming video or for sending pictures and video clips. The Nokia 6170 has two screens - an internal display for enjoying multimedia content including images and video clips, and an external screen with information on incoming calls, date and time. The Bluetooth headset-compatible phone offers up to four hours talk time and up to 11 days of stand-by time. The E530 is a digital-zoom camera phone in a sleek clamshell body loaded with some of the latest mobile technologies - MP3 player, MPEG4 video recorder, multi-media messaging, 64 polyphonic ringtones and Bluetooth. But the real feminine appeal of this Samsung cell phone comes in the form of interactive features, including a fragrance and aromatherapy guide, calorie counter, BMI (body-mass index) calculator for height-weight ratio, and a daily personal biorhythm chart. There's also a shopping list organizer and a personal scheduler.